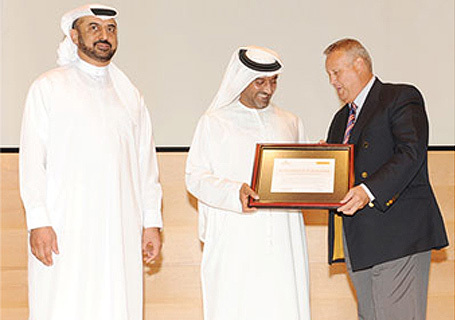 DUBAI, U.A.E., 19th May 2010: Emirates and DHL have signed a Memorandum of Understanding (MOU) to establish a strategic security partnership to enhance air cargo security in the region. Through this partnership, Emirates Group Security and DHL Express will strengthen their collaboration in air cargo security, share best practices and information on security threats, and promote joint training and educational activities. The alliance was acknowledged when the jointly signed MOU was presented to HH Sheikh Ahmed bin Saeed Al-Maktoum, Chairman & Chief Executive of Emirates Airline and Group. The MOU will enable Emirates Group Security and DHL Express to work more closely together in areas of security training and education, threat mitigation and reduction of company risk, towards a more secure and stable environment for employees, customers and the logistics industry. Commenting on the partnership, Dr. Abdulla Al Hashimi, Divisional Senior Vice President, Emirates Group Security, said, "The Emirates Group has always been committed to strengthening security throughout the supply chain. This is another programme which embodies the symbiotic relationship between stakeholders in the cargo industry.” He added, "Whether you work for an airline, airport, civil aviation authority or other AVSEC service provider, understanding the threats and risks to security and how to manage them is crucial. Sharing of best practices and exploring synergy in training and education among major players are important aspects of producing comprehensive and practical approaches to combating threats in the aviation industry. "DHL views this partnership with Emirates as a significant step towards fostering deeper cooperation in the field of security. Jointly our efforts will build a more robust security infrastructure for our respective businesses,” said Garry Kemp, Managing Director, DHL Express Middle East, North Africa and Turkey. "Enhanced security standards in the UAE will also build stronger consumer confidence in the air cargo sector.